"You know there's a Phantom like a block away, right?" my friend Kevin exclaimed as I drained my last sip of beer. "Oh, a Rolls?" I asked, uninterested in the prospect of seeing another luxo-cruiser. "No, an F-4 Phantom fighter jet." This I had to see. It should be explained, as a preface for all of this, that the night started at a happy hour for automotive writers and enthusiasts at the Petrol Station, a gas station-turned-coffee shop-turned bar. A kind of affair where we all try to one-up one another with tales of gearhead stupidity. The clear winner was supposed to be Mark, a Canadian who rolled up to the parking lot in a bright white 1995 Ford Bronco, a replacement for his A/C-less Ford Ranger. "You mean the car I explicitly asked you not to buy?" asked TTAC's Sajeev Mehta, an expert in crappy mid-90s FoMoCo products. Alas, Sajeev was right and by the time he'd made it to the bar the A/C had already gone out, prompting us to call the car "AC" in a tribute to both his mechanical difficulties and, of course, infamous O.J. chauffeur Al "AC" Cowlings. But back to the jet. The North Houston neighborhood of Garden Oaks is part of the mass, unzoned near-town suburbia that features gaudy Tuscan-style $500K McMansions next to preschools, next to bars, next to churches, next to '40s era bungalows, next to fancy new condominiums. It's chaos. Many things are hidden there, though it was unbelievable to me that after two years of drinking at this bar I'd have never noticed a fighter jet. I demanded to be driven there (I'd been drinking, so I wasn't driving) and, sure enough, there was the damn thing. Gigantic. The McDonnell-Douglass F-4C Phantom II, in a peculiar green camouflage, sitting behind unlocked fence next to "Edie's Curls." This majestic warplane, one of the longest-serving conflict aircraft in American history, was on a patch of dirt next to a Buick with its glass broken out and an R/V parked for storage. In the background was the detritus of more condo construction. A plaque explains the plane is on loan to the American Legion Post 560 from the Air Force Reclamation Center in Davis Montham Air Force Base and was dedicated to the site on July 4th, 1991. Somehow, this plane has sat here for almost exactly 20 years and I'd never heard of it. Never seen it. Were it not for Google Maps most wouldn't know it existed at all (if they really wanted to camo it they'd have painted it like a bulldozer). I'm torn between loving this as a monument to Houston's profound weirdness and feeling sad for the jet. Its turbojet exhausts sit neutered on the ground, a reminder of its static state. Its massive 38-foot wingspan is barely contained by a dinky gate. Now I'm pretending to get sucked into the engine of the plane used in conflicts from the Vietnam War to the Gulf War and numerous battles in between. The F-4 was used by the Blue Angels and the Thunderbirds! Now it's stuck in a Houston suburb. Maybe this is what Arcade Fire was complaining about. Ultimately, the jet's only good for something if it's appreciated. I appreciate it. 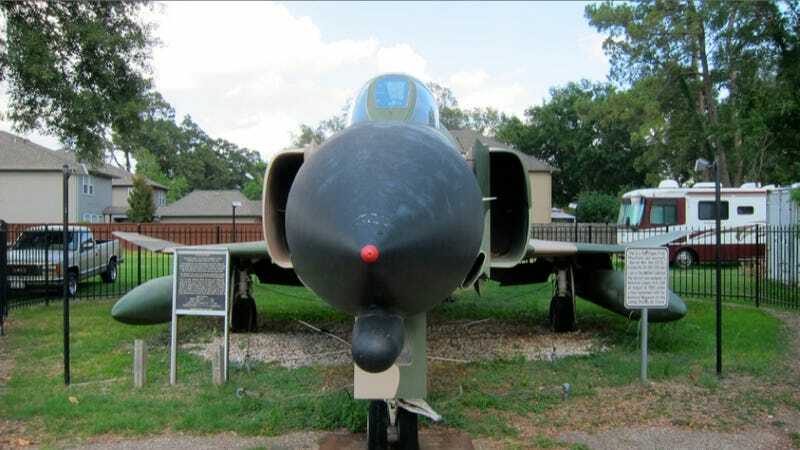 And if you're in the Houston area and love jets, you, too should venture out for a burger with a side of Phantom.